I had not watched a newscast on WITN in Washington, N.C., in 31 years—-until last night. A man did what he had to do to go on with life. Yet, September 5, 2017, had to be one of the most difficult days of Dave Jordan’s life. He went back to work. Only two weeks earlier on Tuesday, August 22, Dave’s boss suddenly died. She was not only his boss, she was his wife. 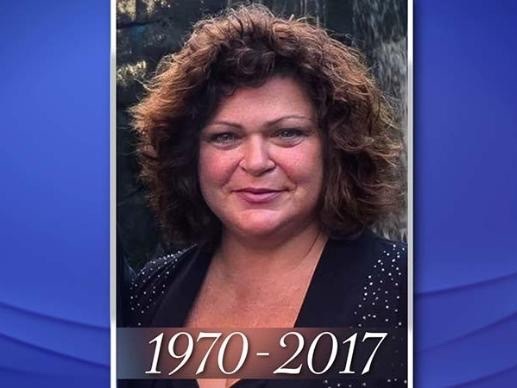 Stephanie Shoop, at the tender age of 46, was news director of WITN where Dave Jordan is the prime time co-anchor. One day, she was wife, mother of two, and a respected leader of a television newsroom. The next day, with no warning, Stephanie slipped away. Dave’s co-anchor Lynnette Taylor told viewers of the loss in an emotional moment at the end of the August 22 early evening newscast. In a previous blogpost, I wrote of how sadness can pervade a newsroom in a fashion that critics of journalism can never believe. It happens in moments when the unthinkable happens. The constant buzz that is usually the hallmark of a television news operation suddenly becomes as quiet as a public library. What brings on the uncommon calm typically is in that rare instance when someone whose face and personality are as familiar as a member of one’s family is suddenly gone. The stark reality strikes that the someone in question will never return. My father was a minister for 65 of his 87 years. Often, he told me that the most difficult times were when he had to reach out to a family who just experienced a sudden and unexpected loss. Stephanie Ann Shoop was a native Pennsylvanian. In 1995, she married a man named David Giordano who grew up in the small Pennsylvania town of Sheffield. Dave made his way to Eastern North Carolina 20 years ago after a brief stop in a small West Virginia market. In 1998, Stephanie joined WITN as a newscast producer—a job that is frequently rewarding because the producer shapes a half-hour of news much as a sculptor does a bust. Three years later, she became news director; in reality, her promotion made Stephanie her husband’s professional superior. Husband-wife pairs can be an emotional boon or a periodic headache for management. Some corporations have specific policies against spouses working for the same television station, or at least in the same department with the same boss. In the mid-1980’s in Wilmington, N.C., I had two couples who worked for me at WWAY. They could not have been more pleasant or more professional. One husband was my chief photographer. His wife was in production. The other couple were my 11 o’clock anchors. Richard and Jill Rogers were an immediate hit when I hired them away from WSAV in Savannah, Ga. Richard also did the 6:00 news. They were equally gracious off the air. Jill did not stay in news over the long haul. Richard is still active as the lead anchor at WRDW in Augusta, Ga.
To stay in a city such as Washington, N.C., for nearly 20 years, one has to love it. Dave and Stephanie apparently made a real home there. Here’s what you may not realize: Washington is part of Greenville-Washington-New Bern, one of those challenging animals of television known as the hyphenated market. Each city’s viewers are typically jealous of their own local news and are not crazy about seeing many stories about the other two cities on their station’s newscast. Here is something else you may not know: the estimated population of Washington, N.C., as of 2016, was 9,801. That may be the smallest city in America to have its own television station. What may not be an understatement is to say Washington may be the Mayberry of television cities. In a town of fewer than 10,000 people, everybody tends to know everybody—or at least that is the way it seems. If I lived there, I would probably see people who would light up if they saw their anchorman in a local restaurant. “There’s Dave,” I’m sure they would say. When you are in a viewer’s living room or den every night, you become a member of the family, especially in a small town. Stephanie was not a household name in the community except to her close friends. News directors, unless you are like this old guy was when I held that job and did commentaries three nights a week, are typically unseen and unfamiliar to the general public. Yet, she found her fulfillment as the guiding hand of WITN News. Over the years, she no doubt saw dozens of young journalists come and go. At 46, her news staff was likely like an extension of her own two children. Sometimes, a news director has to make unpopular decisions. At times, you have to hand out discipline. On occasion, you have to let people go—-truly never a pleasant decision even if the person being axed was not one who would be missed. When you are in a leadership position for 16 years, you no doubt will have some people who decide they don’t like you. However, my perception is those were few and far between in Stephanie Shoop’s world. Even if you have occasional dysfunction—and every newsroom does at some point—a TV news operation becomes a family. The morning of August 22, the head of the family at WITN News was snatched away in the twinkling of an eye. It’s really hard to find the words… and fight back the tears long enough to write this. She was an amazing news director — but an even better mom, we all knew her as both. I am where I am now and more importantly I am who I am because of Stephanie Shoop — She was my News Mom, she was our News mom – she raised us right, she took in kids often for their first job, and turned us into well-rounded compassionate hardworking journalists, and she did it with love. You were the best possible example of a leader I could have hoped for. You let me get on the anchor desk when I weighed 500 lbs — who does that!?!? Like everyone in the WITN family, we were not ready for this. But because you were in our lives we will find the strength together. Dave, David and Grace — we’re here for you. I can think of no finer tribute than for Stephanie to be called one’s News Mom. That says to me—and should to many others—that she was much more than a news director. One is not handed a label as Bill presented to Stephanie without being one who truly cares about people. Without question, I hope Bill’s words were among many to help sustain Dave and the Jordans’ two children David and Grace. A family, whether in television news or in any aspect of life, is a rallying center in times of sadness and deep tragedy. Emotions are not one size fits all. A sudden loss can send some people into an extended tailspin that requires a longer period of adjustment and grief before returning into the workplace. Another family I knew lost their son on a Sunday afternoon in a skiing accident at a lake in South Georgia. The next Sunday, three days after the teen’s funeral, the family was back at the lake. “If we didn’t do this now, it would take us a lot longer to get on with life,” Bewick Murray, the father, said. Everyone is emotionally different. When I read that Dave was returning to the air Tuesday night, I had to log on to WITN.com. I was not watching out of a viewer’s curiosity but as a member of the broadcast journalism fraternity. I have not experienced the specific type of loss as has Dave Jordan, his children and the WITN family; yet, on the same day as Stephanie’s death, I received a call informing me of the death of my last living uncle, only six days after the passing of my oldest uncle. “I’m not going to pretend this is easy. But I’ve reached a new reality in my life and it’s going to be that way for me and for our two children. Dignity in a time of deep difficulty—that was the personification of Dave Jordan Tuesday night. No doubt, many of those comments of encouragement and condolences have come from people Dave has never met. I will add one of my own: Dave, I’ve done the job you do and the job Stephanie did. You don’t know me…..but if you need me, The Old TV News Coach is here. May God continue to bless and comfort you and your family.